The original Reliant windscreen rubber section used in the Mk1, 2 and 3 Coupes has become like rocking horse sh*t - it is difficult to find and if you do find some it is most likely too short as it has been cut to length for a Reliant screen. Furthermore, it is old stock and is liable to split when you try to bend it around the corners. The original supplier to Reliant had disappeared almost two decades ago, so new stock has not been available since then. To fulfill the needs of Midas owners, I decided I should get a new extrusion tool made and get some new windscreen rubbers manufactured. Some of you will already know all about this because you contacted me last year (or earlier) and I put your names down on a buyers list. I have already been in contact with the members of that list and the first batch of 15 rubbers are ready to go out. 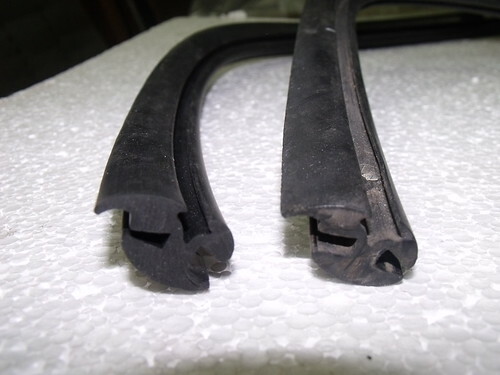 The newly extruded rubber is shown to the left in the photo below. It is an almost exact replica of the original seal (to the right), but as it is new it is still nice and supple. I trial fitted it to a laminated windscreen (they are about 0.5mm thicker than the toughened screen) and it went on quite easily. It fitted around the corners nicely, with the outer lip stretching when required.